Don Thompson will be replaced by British restaurant veteran Steve Easterbrook. There’s never been a British CEO of McDonald’s, that all-American icon which represents the best and worst of American success and excess. That will all change in March though when Steve Easterbrook, the former CEO of Wagamama and Pizza Express, takes the helm. The Brit will be replacing Don Thompson, who has been with the fast food giant for 25 years, but whose two-and-a-half-year reign as CEO and president has not been an especially happy one. Sales have struggled to keep apace in its core US market as incomes at the lower end have been squeezed and alternatives such as Chipotle, Five Guys and Shake Shack have proliferated. It looks like last week’s news that annual like-for like sales had fallen for the first time in twelve years, was the straw that broke the camel’s back. Easterbrook, who was raised in Watford, has a long history with the company. Before leaving to join Pizza Express he was credited with successfully boosting sales when head of McDonalds’ UK business. He returned to the company last year, accepting a job as chief brand officer at its Illinois headquarters. Now he certainly has his work cut out. Easterbrook’s promotion will increase speculation that another talented Brit could be on their way to Illinois. 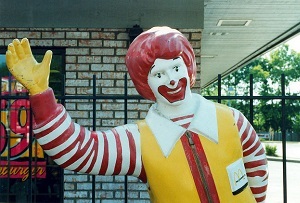 Jill McDonald (no relation to Ronald), chief exec of McDonald’s UK since 2011, has delivered strong results. Since she joined as marketing chief in 2006 the business has enjoyed 34 quarters of consecutive growth. Perhaps we could be seeing a McDonald helming McDonald’s again sometime soon?